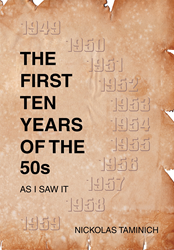 Recent release “The First Ten Years of the 1950’s – As I saw it” from Page Publishing author Nick G. Taminich is both historical and entertaining; this work encompasses a past time of family, love, society and friendship. Nick G.Taminich, a creative writer and author, has completed his most personal work to date “The First Ten Years of the 1950’s – As I saw it”: represents a philosophical and in-depth work that delves into the author’s own past with a travel back in history to our own past in this country. What he saw then and now remembers, is a refreshing read. Many of us talk about the past; Nick personally takes all of us in print back there with him. Published by New York City-based Page Publishing, Nick G. Taminich’s profound work puts together the author’s thoughts and feelings to tell a story about another time. California author Nick G. Taminich has over 45 years collected bits and pieces for books. Those scraps of paper from stored boxes are now put together. From his small quiet ranch in Huasna Valley south and east of San Luis Obispo California he has made sense of lost thoughts. Now past 70 years old, he still finds time to search for aquatic fossils along the central California coast. Readers who wish to experience this enlightening work can purchase “The First Ten Years of the 1950’s – As I saw it” at bookstores everywhere, or online at the Apple iTunes store, Amazon, Google Play or Barnes and Noble.